Residents of St David’s, in Pembrokeshire, will soon be having their homes powered by a 400kW tidal power generator that was unveiled in Ramsey Sound last week. 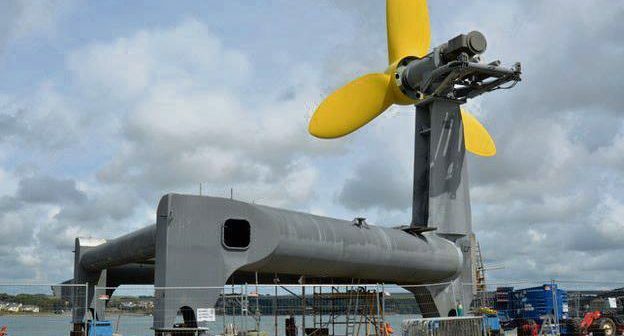 The trial project will run for 12 months generating energy from tidal currents on the sea bed, and is being hailed as Wales’ first grid connected free standing tidal turbine. 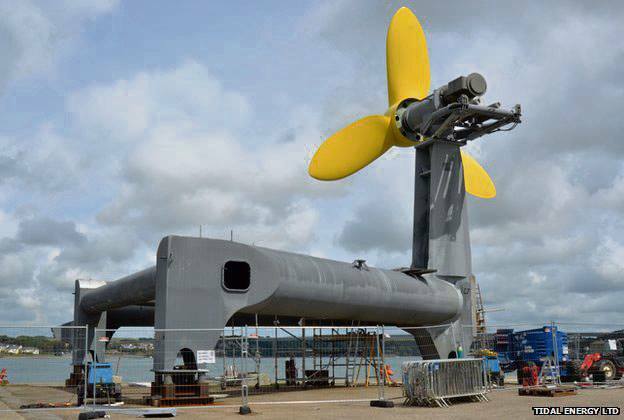 It is hoped that this trial scheme will lead to a larger project for Tidal Energy Ltd, which will incorporate nine, 150 tonne, seven story high turbines which are due to be built in Pembroke Dock by Mustang Marine. Mustang Marine were recently saved from administration and, should the project go ahead, it is hoped it will secure the company and the jobs it provides for the foreseeable future. The finished project will produce 10MW which is enough power for 10,000 homes. The scheme has received high praise from First Minister Carwyn Jones, who openly supports tidal energy as a way of reducing reliance on fossil fuels and meeting green energy targets. He has also hailed the project as an example to the rest of the world, showing that “we are able to harness the considerable energy that exists in our seas and that we are able to develop the technology necessary to do that”. He has also praised the scheme as a great opportunity for local people and businesses. The scheme has come under some criticism, however, as the generator is located in a Marine Special Area of Conservation, as the site is one of the best marine environments in Europe, as well as including a busy shipping port. This means the area has special legal protection. The turbine has therefore had to be designed with features that minimise its impacts on the surrounding environment and have as little disruption on existing shipping routes as possible. The project cost £16m, half of which was EU funded and half was from the majority shareholder Eco2 Ltd. This is not the only tidal energy scheme in Wales; a £70m project off the coast of Anglesey is due to be operational in 2016. Schemes such as this show how even in protected areas, through specialist design and careful planning new technology can be installed to help us reach targets for a greener future.